[無料] Antivirus Thor Lite - Virus, Malware, Adware Scan | Mac App Storeのアプリ検索・ランキング BuzzMac! Dear Thor Users, Someone is fake reviewing our app with negative 1 star reviews. We had reported to Apple and hopefully they will take action. 2. the paid version is 99% identical with the lite version. Have a look at the reviews of the paid version and you will spot that someone wants us to not protect Mac users. Any person can use a VPN to hide his IP address, create a iTunes username and use it to download our app and fake review it. Thank you all for understanding and hope that the Apple will solve this problem soon. Alert! A new Mac malware strain called FruitFly 2 was spotted in the wild. Extreme caution is required. All macOS systems are affected. Please download Thor Antivirus - the leading antivirus solution from the Mac AppStore and defend your Mac. Keep an eye on what apps you install from unknown sources. ◎ For a full Thor experience please consider in purchasing the FULL version of Thor Antivirus for only $9.99 one time payment, no hidden costs or monthly subscriptions. It will really help you fighting all kind of malware. 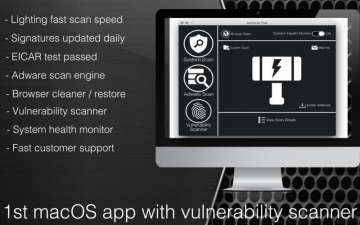 1st security software that comes with macOS vulnerability scanner. Most of the data breaches comes because of the not updated software. For a full Antivirus Thor experience please buy the full version for only $9.99 one-time payment. Thor come with the solution. A simple scan of your installed application and check if you have the latest version installed. We don’t slow your computer down with big updates; instead, our continual stream of automatic micro updates always keeps your protection current. More people around the world trust Thor Antivirus for their security. That means better security for all of us. The reason is simple: We see and react to more data from more users, so we can make your protection better. Antivirus Thor passed the EICAR - European Expert Group for IT-Security test file.